Apron belts with nails on our BREDA series belt as a base and with special thermoweldable profiles. The U-shaped double pins make it impossible for them to fall onto the material, making them very reliable when dealing with heavy loads. Prevents possible accidents caused by breakage of the profiles. The guide profiles prevent misalignments of the belt. Our BREDA series belts, which are majority PVC, are specially designed to perform under difficult conditions like abrasive, mineral oils and cuts. The transverse rigidity assures that the belt is totally flat on the slider bed. Easy to center on very wide conveyors. In esbelt, we have available different types of belts for conveying detergent, depending on the type of soap (bar, powder), the conveyor and the processing phase of production, etc. Our ESPOT and DRAGO belts perform well with bulk products and troughed conveyors on rollers. Our FEBOR belts perform excellently with dry detergent powder reaching temperatures of 90 and 110ºC. The working life of our conveyor belts is much higher compared to some previously tested competitors´ belts. Our KERAM series belts have been used for years in the press exits, metal cutting and stamping lines, cooling circuit for finished pneumatic tyres, bambury and tubing exits as well as the entry to the rubber cooling line. Good performance in high impact zones. Resistance to high working temperatures. Hot rubber does not stick to the belt. Minimum stretch and long life. Our PU belts in the BREDA and KERAM series offer excellent performance in the metal sheet winding and cutting applications. Excellent resistance to cuts, abrasion and all types of mineral oils. Unlike the rubber belts frequently used in metal sheet winding and which is usually impregnated with oils, our PU belts remain flat and the borders do not curl up upon contact with oils. 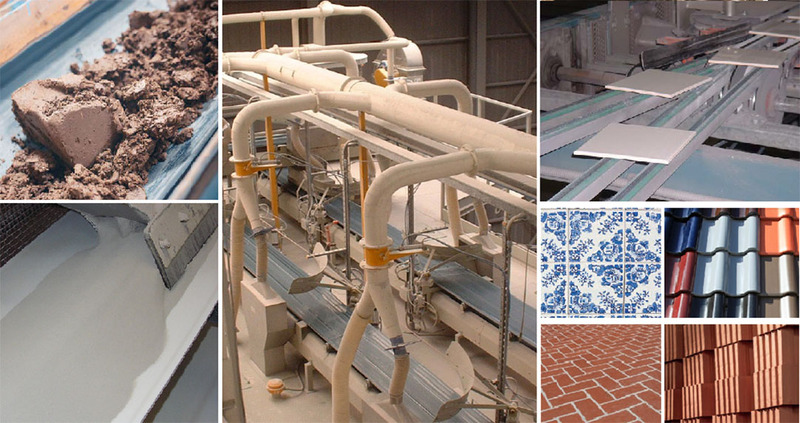 We offer a wide range of PVC belts, PU round belts and vee belts as well as polyamide buckets for different processes in the ceramics industry including the production of floor tiles, roof tiles, bricks and pavements. Our DRAGO series belts have proven to resist the high temperature of atomized clay and are commonly used in trough conveyors and bucket elevators. Our BREDA and HIPRO series belts are resistant to abrasion and mineral oils and are used to convey processed clay from molders, extruders, presses and cutters.